Comprehensive list of all known medium format sliding adapters such as Kapture Group, Phase One FlexAdapter, Cambo and all others, for using medium format digital backs such as Phase One, Imacon, Hasselblad, Jenoptik on 4x5 and 6x9 large format cameras. What to be aware of, when you decide which sliding back to consider. First you need to decide whether you want a single-shot sliding back or a sliding back that offers multi (overlapping) potential. This also depends on the size of your sensor, as to how many overlapping images you can capture (with early backs of 6 or 11 megapixels it is usually three shots; with larger 22 megapixel sensors it is usually two shots). Be sure you are aware of the extra cost of the viewer. Be aware that the angle of the viewing eye-piece affects your workflow. Some viewing backs require you to buy or otherwise supply a viewing screen. And you have to be sure what kind of attachment you want: Hasselblad V-series, Hasselblad H, or other. Recognize that you will not always be able to focus an ultra-wide angle lens, because with most sliding adapters, their thickness means the lens can’t get close enough to the sensor to focus at some distances. In most cases you need a special multiple-line cable release. These are available from Kapture Group (you don’t need to use their sliding back; their cable releases work for the sliding backs of other manufacturers). 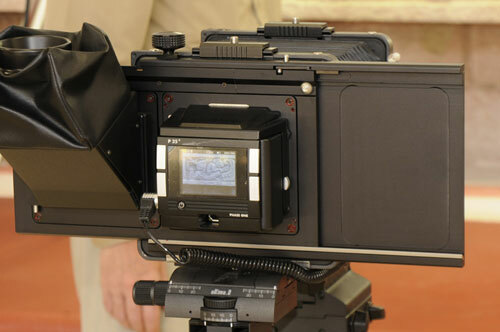 The Arca-Swiss Rotaslide sliding camera back includes the ability to rotate from portrait to landscape position. You need to supply your own focusing screen, and I would assume your own viewing prism. Since Arca-Swiss has no website of its own, there is very little information on the Arca-Swiss Rotaslide sliding camera back on the Internet. One company asks almost two thousand dollars for this sliding back and is not even able to show an image of it. I have tried every year to obtain an Arca-Swiss Rotaslide camera back adapter to test and it never gets sent, so instead I am evaluating a 4x5 sliding back adapter from Cambo. Cambo sent one within 72 hours of asking for it, and replied to my e-mail within 24 hours. Cambo offers, in effect, three different multi-shot sliding backs, the Cambo Multistep Adapter allows you to stitch and create the following file sizes. CSL-23, one shot, so it fits any size sensor. CSL-369 for a 24 x 36 mm sensor. You need an adapter (to hold your back, select from Hasselblad V, H1, Mamiya, Contax, etc). You need a mask, depending on the sensor size you intend to use. In at least some cases you also need a special Kapture Group cable release. Be sure there is an adapter to hold the kind of medium format back that you own or intend to buy. The Cambo sliding back is intended to fit the Cambo Ultima 23. You will have to ask for the 4x5 version to fit the Cambo Ultima 4x5, the CMSL-45. Cambo sliding back System used on the digital back Phase One P25+. The Horseman X-Act-D looks like a modified copy of a Rollei X-act camera. Since Horseman is allied with the Japanese distributor of Rollei this possibly comes as no surprise. The back can be shifted 15mm to either side, so the Horseman spec sheet states that you can get a tiny amount of stitching, 15 plus 15 mm. The Horseman LD is a relatively new product (early 2006). 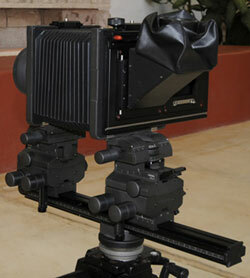 It allows you to attach a Nikon of Canon camera to a 4x5 rail system (so you can use Rodenstock or Schneider lenses). You can also use Hasselblad or Mamiya lenses, but Rodenstock are much better. The downside of the Horseman LD is that it is an L-shaped system so subject to sag. This is a basic sliding back to allow using a medium format back on a 4x5 view camera. The Kapture Group TrueWide Digital sliding back is a complete camera, not a separate back for a wide format camera. The Kapture Group TrueWide Digital sliding back holds Nikon, Canon FD, Leica R, and other lenses (only one at a time; each requires a special mount). Be aware that a 35mm SLR lens covers only early smaller sensors. This is not the kind of system to use for a 22 megapixel sensor or larger. The viewer can be any Hasselblad viewer. Kapture Group offers a stitching sliding back adapter and a regular single shot model. At first this reminds me of the concept behind a Sinar 16-shot system, but it’s not really the same at all. Sinar moves the sensor a pixel or fraction thereof, in a roughly $30,000 digital back. Kapture Group QuadStitch is a hand-cranked manual overlay system that you then have to stitch in Adobe Photoshop. The new Alpa 12 MAX camera looks like it can achieve everything the Kapture Group QuadStitch can offer, and more. But the Kapture Group QuadStitch is perhaps $5,000+ whereas the Alpa 12 MAX may max out at $20,000 by the time you pay for each and every one of the multitude of required accessories. I gave up even trying to make a list of all the viewers and accessories that seemed to be required, each at another thousand dollars it seemed. The Linhof 679 comes in several models (each one replacing the previous one). The Linhof site in Germany (2006) still lists the 679cc. Sites in Canada and the US show the 679cs. The Phase One FlexAdapter is available to fit most cameras but unfortunately it is 1 mm off to fit the Cambo Ultima 45. This adapter is tough to find on the Phase One site, since it does not appear in the Phase One search engine nor on any drop down menu (there is no listing for “accessories”). In January 2009 I was not able to find the Phase One Flexadapter sliding back adapter on the Phase One site even searching for it by name. And there is still no listing for accessories. Since Mamiya now partners with Phase One and since Mamiya now offers a 4x5 sliding back adapter I was curious to see if the Mamiya model was simply a Phase One with features for the Mamiya. But no, there are no specific similarities between the old Phase One 4x5 Flexadapter and the new Mamiya 4x5 sliding back adapter. Price is approximately $3,490 (at Calumet Photo). At Photokina ’08 Mamiya announced a 4x5 adapter, which is normally called simply a sliding back adapter. The difference is that the Mamiya sliding back adapter is only intended to hold a Mamiya ZD digital back. Silvestri makes a manual sliding adapter, # D7021, for its own Silvestri Bicam, T30, or Mod H.
This Silvestri sliding adapter, has optional adapters for it to fit onto a Sinar 4x5, Cambo 4x4, Arca Swiss 4x5, Toyo 4x5, Linhof 4x5. With an adapter board it fits the Linhof M679, Arca Swiss 6x9 and Sinar P3. A 4 x 4 sensor will produce 4x4 or 4x7. A 4x5 sensor will produce 4x5 or 4x7 if overlapped. Silvestri makes one of the few motorized sliding adapters. The SinarBron USA website (in summer 2006) seems to be suffering the results of the continued downsizing of Sinar. The accessories page was blank, empty except for “Coming soon!” There was no search capability. It was not until Sinar was bought out by Jenoptik two or three years ago that the Sinarbacks (now from Jenoptik) were close to truly portable. Today, at Photokina ’08, Sinar was a more lithe believeable company that appears as though it will survive because it finally understands that photographers have more choices nowadays: they can select ArcaSwiss or any other brand rather than a Sinar. Once Cambo provided FLAAR testing institute with a 4x5 Cambo camera, we quickly learned that this Dutch-made camera actually held up better than the Swiss-made camera that Sinar loaned about six years ago. About six years ago Sinar sent an old, used, and worn out loaner-camera, that literally fell apart because the components were not properly maintained by the earlier people who had borrowed it all over the world. I sent this camera back to Sinar because it was not usable. Cambo was intelligent: they sent me a brand new camera (not an old used one). And Cambo provided the camera up front outright. So today (six years later) I am using two Cambo 4x5 cameras and zero Sinar cameras. FLAAR has issued many evaluations, reviews, and comments about the Cambo 4x5 cameras. Since we don’t any any Sinar cameras rather obviously we are able to write reviews on them. Sinar now has a Sinar Sliding Adapter. It will accept a Sinar Hy6, Hasselblad V, Hasselblad H, Mamiya 645 AF and venerable Contax 645 AF fittings. I do not see Phase One on that list (obviously Sinar and Jenoptik are not keen to support their #1 competitor, Phase One). 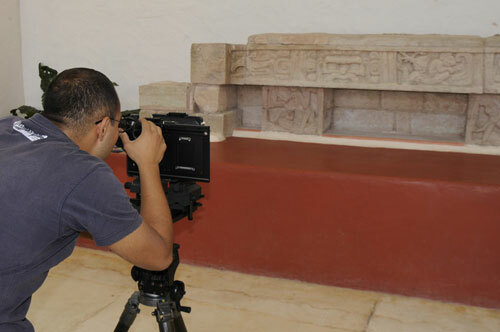 Copan Museum Honduras, when he and Nicholas Hellmuth photographed some samples about the Mayan Art. There may be a few other sliding adapters out there, such as from Plaubel, but that camera has an L-shaped frame that causes any back to sag. Otherwise the list on this page above is the most complete list of medium format sliding back adapters for 4x5 view cameras that I know of. If I notice any more at Photokina 2010, I will add them in the future. Most recently updated January 15, 2009. First posted July 12, 2006. Updated after Photokina 2008.